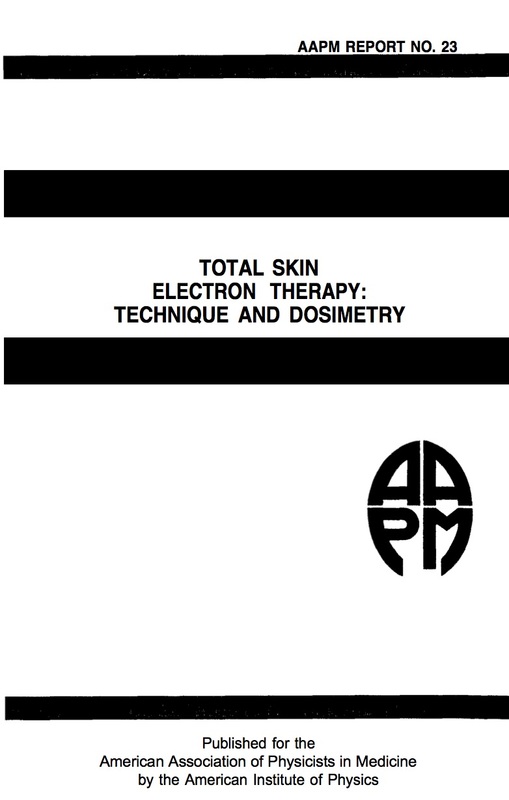 This report describes the techniques and dosimetry for Total Skin Electron Therapy (TSET) at energies of about 3-7 MeV at the patient and 4-10 MeV at the accelerator beam-exit window. The irradiation beam requirements are identified on the basis of clinical needs for the treatment of cutaneous T-cell lymphoma, a chronic progressive lymphoma, most often treated with TSET. It is usually called mycosis fungoides, but is sometimes denoted as Sezary syndrome. This therapy is also identified in the literature by combinations of words in part abstracted from TSET together with additions such as: whole body or whole skin, superficial irradiation, or electron beam. The title Total Skin Electron Ream Therapy (TSEBT) is such an example.